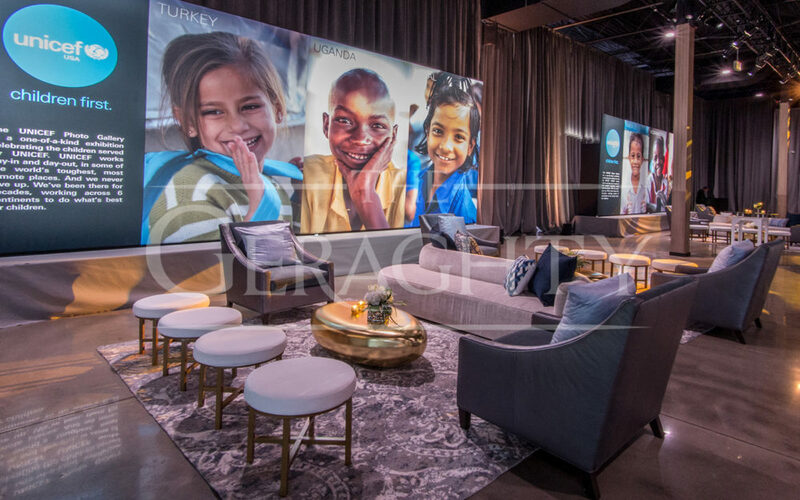 In Spring 2018, UNICEF returned to The Geraghty to celebrate its annual Chicago gala. This was the 3rd consecutive year the global organization has hosted 500 guests in the space. The goal of this event was to raise funds and awareness for UNICEF’s life-saving programs for children in need around the world. 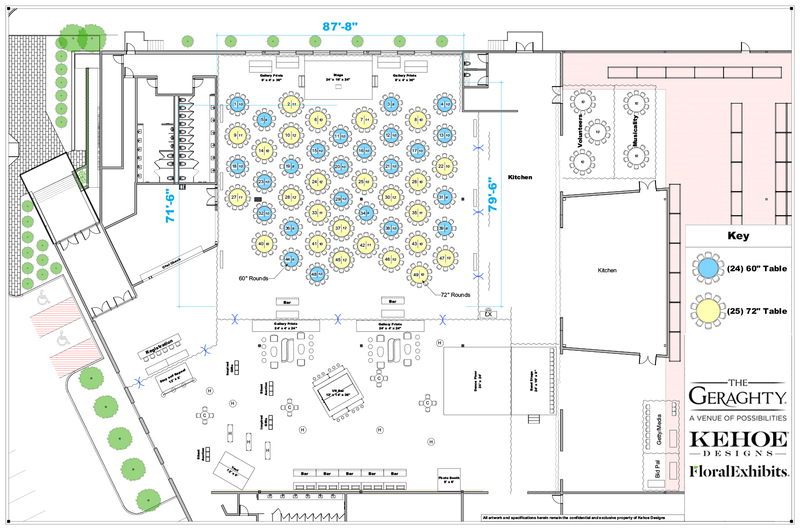 The Kehoe Designs team crafted a thoughtful floor plan of The Geraghty to embrace UNICEF’s mission of providing help and hope to war-torn and impoverished areas by allocating space within the venue for reflection, honor, and action. 22’ ceilings allowed for large-scale banners to connect and educate during the interactive cocktail hour. 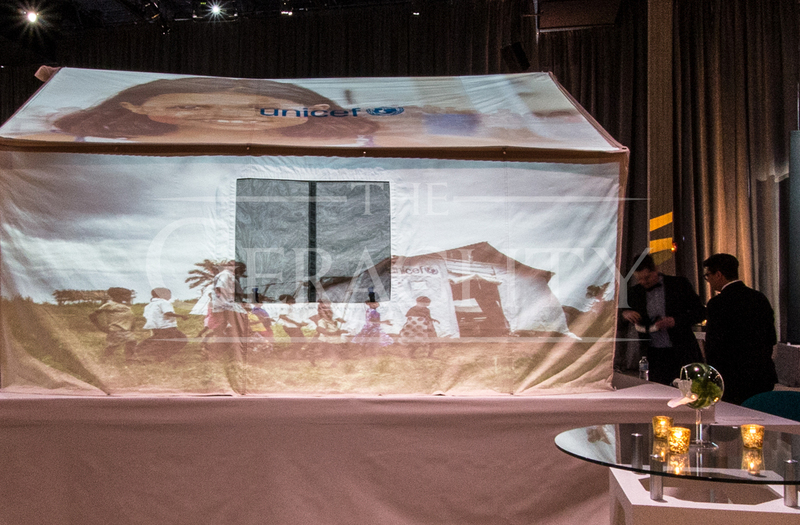 Elevated 12’x14’x36’ stage featured a projection-mapped, authentic field tent focal. Separate seated dinner space provided a “grand reveal” moment. 810 feet of white ceiling draping created intimacy within the dinner space. Illuminated tables allowed for moments of effervescence throughout the seated program. During dinner, the cocktail space was transformed into the after-party with a hidden stage that revealed the showcased band. The technical production team set this event apart from previous years by creatively utilizing audio and visual capabilities. 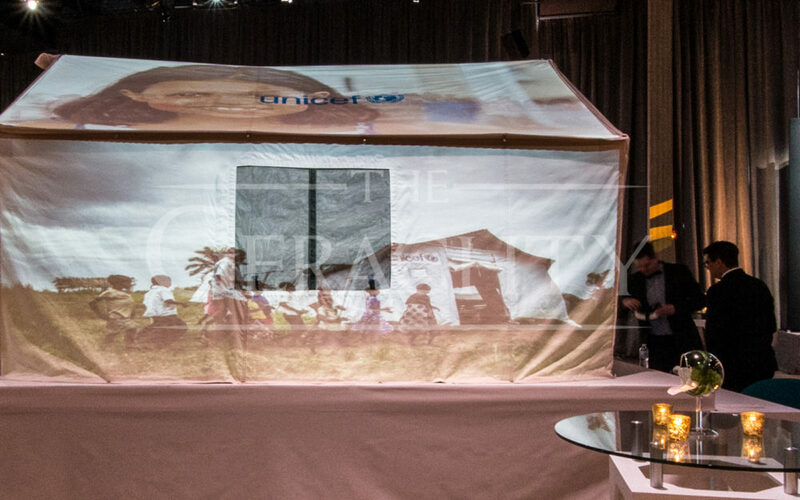 During cocktail hour, guests interacted with a projection-mapped field tent displaying footage of UNICEF’s field work. The footage gave an emotional glimpse of daily life within developing countries that educated and inspired potential donors. 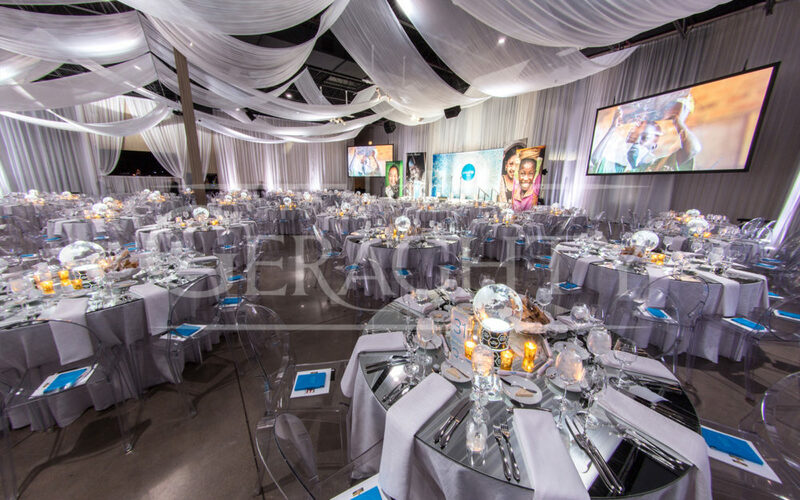 In the dining space, 9’x16’ projection screens flanked a 24’x16’x24’ stage to accentuate the seated program. 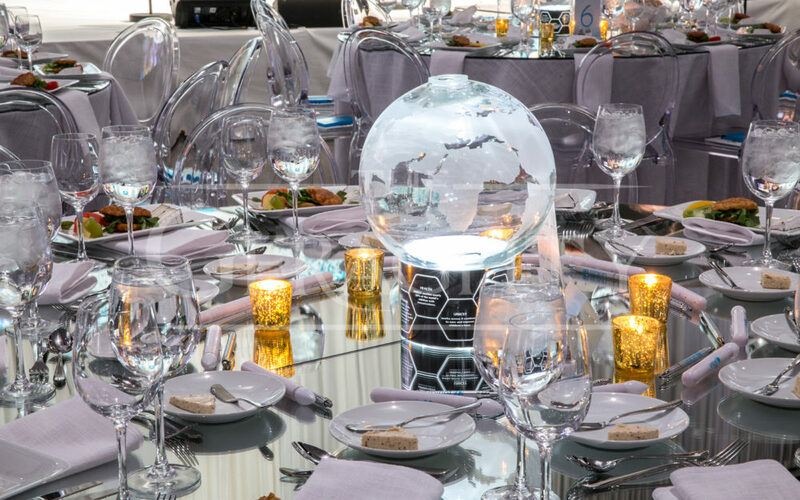 Table illumination was activated at a specific, emotional moment in the evening, emphasizing UNICEF’s philanthropic mission while filling the room with an unforgettable glow. During the after-party, a hidden stage revealed the band and gave guests an energizing surprise. The stage backdrop was a rear projection screen which displayed imagery of the evening and simulcasted guests dancing. For cocktail hour the design and decor engaged guests by offering fascinating and approachable elements to explore and discover. The space was equipped with two large canvas service-tents identical to those seen in the field providing aid around the world. These tents welcomed philanthropists with projected videos displaying impactful narratives as well as an interactive life-size mock-up of a mobile school house. The symmetry of the room was balanced by oversized printed portraits of smiling children who’d received aid from UNICEF. These portraits flanked styled vignettes that allowed guests the opportunity for conversation and reflection upon the organization’s mission. In the dining room, Kehoe Designs artfully executed a clean look that highlighted UNICEF’s core mission. Draped in white, the dining area was a refreshing complement to the dramatically lit cocktail hour décor. Floor-to-ceiling silk drapery gracefully framed the perimeter while beautiful ceiling drapery created intimacy within the space. 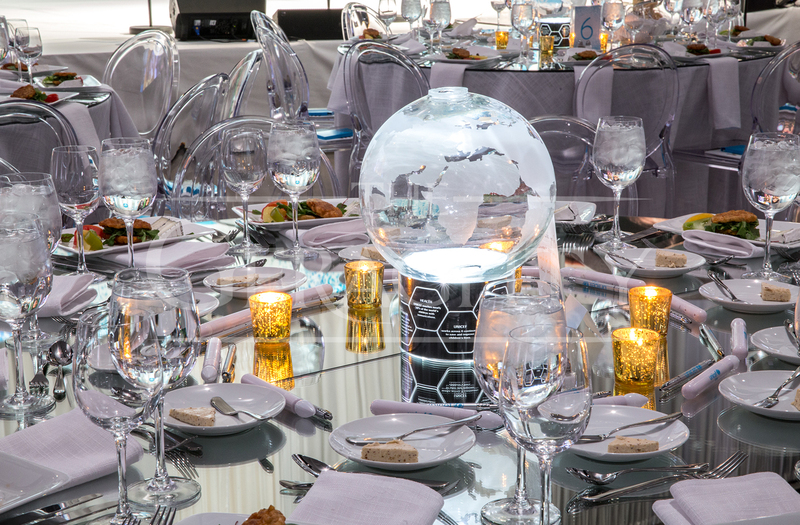 Mirrored tabletops maximized the airy installation above while UNICEF’s glowing globe centerpieces complemented both the surprise table illumination and the importance behind it. The Geraghty’s clear, acrylic chairs allowed for ample seating while adding to the clean aesthetic. Aside from large-scale portraits by the podium, select gold accessories and minimal blue UNICEF branding were the only pops of color in the room. Wrapped in ethereal elegance, the 11th Annual UNICEF Gala Chicago successfully brought hearts together to change the future.